Gold and silver futures posted their fourth straight set of session gains Monday, with each ending at about two-week highs. Gold for February delivery tacked on $8, or 0.6%, to settle at $1,265.50 an ounce on the Comex division of the New York Mercantile Exchange. The settlement is the strongest since Dec. 6. "Gold futures, as well all of the precious metals, are looking good as it appears the tax cut deal is done and it could increase the odds for inflation in the new year. On top of that the Fed interest rate increase is in the rearview window, so the outlook looks more shiny," MarketWatch quoted Phil Flynn, senior market analyst at Price Futures Group. 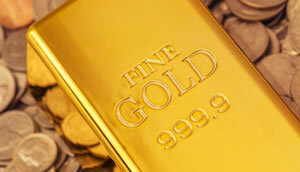 Gold futures traded from a low of $1,255.30 to a high of $1,267. They gained 0.7% last week for their first weekly win in four weeks. Silver for March delivery added 14.2 cents, or 0.9%, to finish at $16.205 an ounce. The close is the highest since Dec. 4. Silver futures ranged from $16.05 to $16.22. They advanced 1.5% last week. January platinum jumped $23.80, 2.7%, to $913.20 an ounce, trading between $891.10 and $915.30. Palladium for March delivery declined $3.35, or 0.3%, to $1,012.05 an ounce, ranging from $1,006.35 to $1,019.85. On Thursday, palladium ended at its best price since February 2001. The two metals posted respective gains last week of 0.7% and 1.9%. Gold rose $6, or 0.5%, to 1,260.60 an ounce. Silver fell 10.5 cents, or 0.7%, to $16.09 an ounce. Platinum gained $20, or 2.3%, to $902 an ounce. Palladium declined $13, or 1.3%, to $1,015 an ounce. Last week, gaining London metals prices included gold by 0.3%, silver by 1% and palladium by 1.9%. London platinum prices fell 1.1% last week. United States Mint bullion sales advanced by a combined 9,500 ounces in gold coins. Below is a sales breakdown of U.S. bullion products with columns listing the number of coins sold during varying periods. Products with an asterisk (*) are no longer available.